A markdown editor with version control and hosting all in one. A blazing fast markdown editor in the cloud. Built by technical writers to improve the UX of our daily content workflow and remove the complexity of actually writing. Same-page authoring and team draft links. 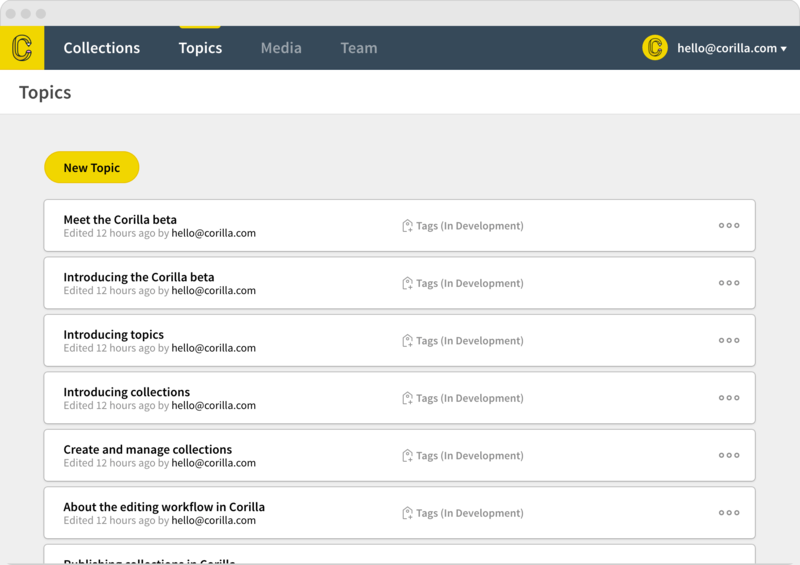 Designed from the ground up to improve the collaboration between writers, developers and the entire organisation. Maintain your content in a dedicated repository with powerful search and tagging plus the security of full version control. Freedom from duplicate files or ambiguous version names. Modular content publishing allows you to choose your flavour of topic-based authoring and single sourcing to maximise content re-use. No more dead-end wikis. Your internal documentation has never been more discoverable or dynamic. Company-wide private documentation or role-specific guides for new hires or reporting in just a few clicks. Unlimited documentation hosting with the option of custom domain, integrated publishing to external services or self-hosting. Write once and publish anywhere. "Corilla is the new technical writing. Our writers love it. Our customers read it." Medium and Large plans start with a free 15 day trial. A great choice for startups and small content teams. Unlimited hosting for your projects means both internal and public documentation. Customised knowledge bases with your company’s branding and a custom domain. And all the power of Corilla’s unlimited hosting and collaboration. The complete solution for your company’s documentation. Unlimited hosting and collaboration across your entire corporate content suite. For enterprise and white label options, get in contact with us. We bring the amazing workflow (*but you'll still need the amazing grammar).